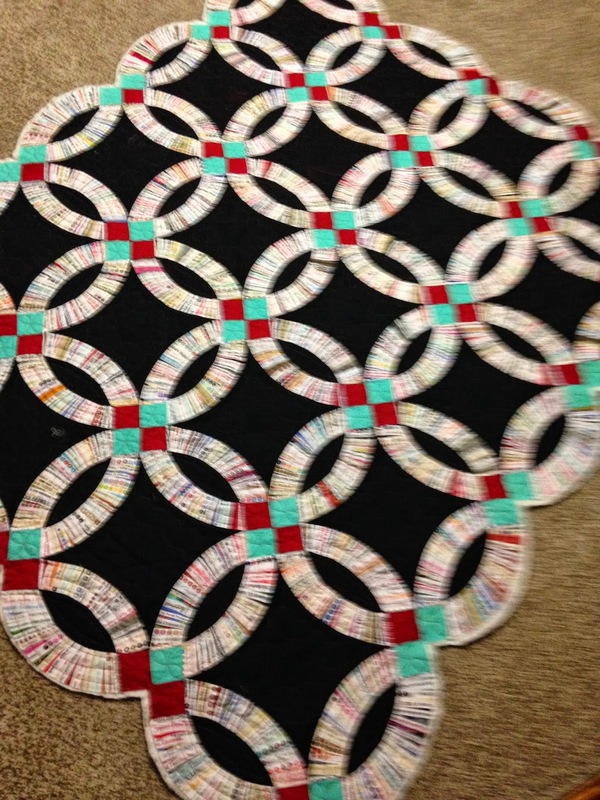 One of my customers sent me this quilt to "finish quilting". It's a double wedding ring and the "rings" are made from selvages from quilting fabric. I've seen a few "SELVAGE QUILTS" and thought they were kinda neat but none really tripped my creative trigger and told me I really needed to save my selvages and make one. Until now... 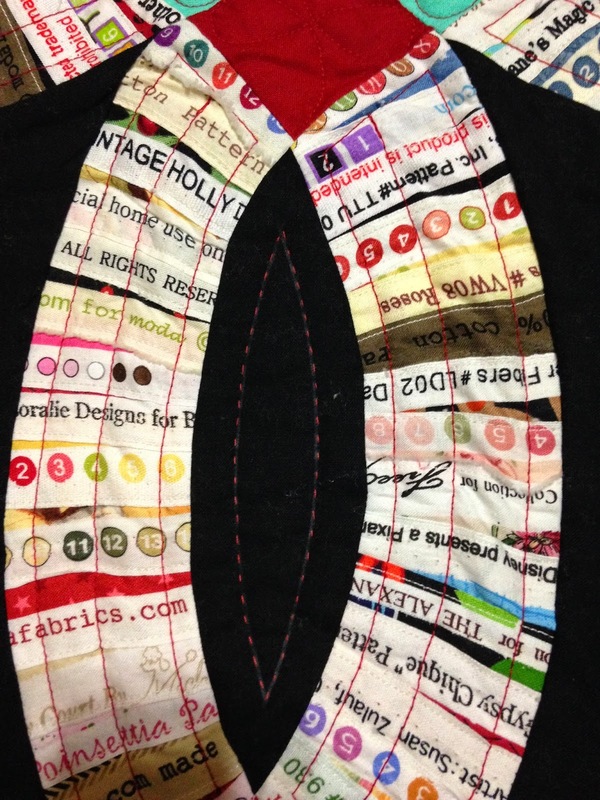 I LOVE THIS SELVAGE QUILT!!! 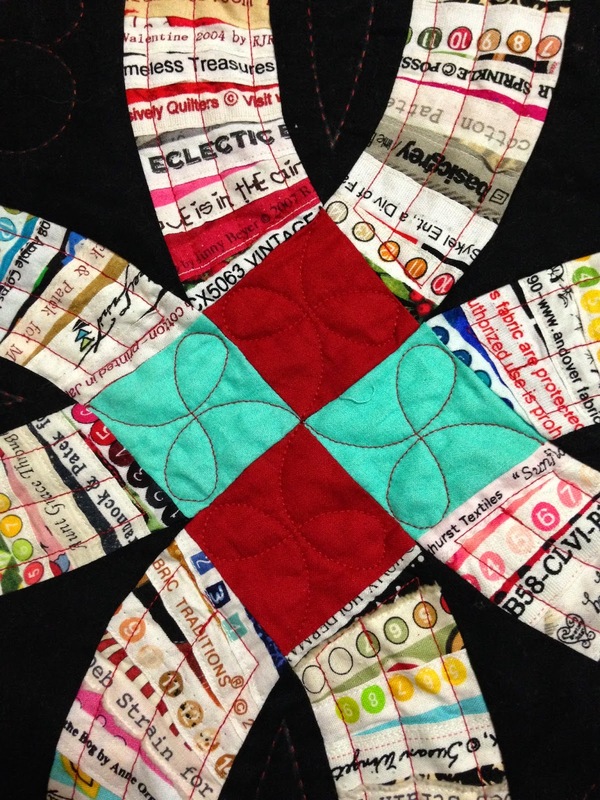 I love the colors, all the selvages, the quilting, the pattern... everything! Ruby made the quilt. 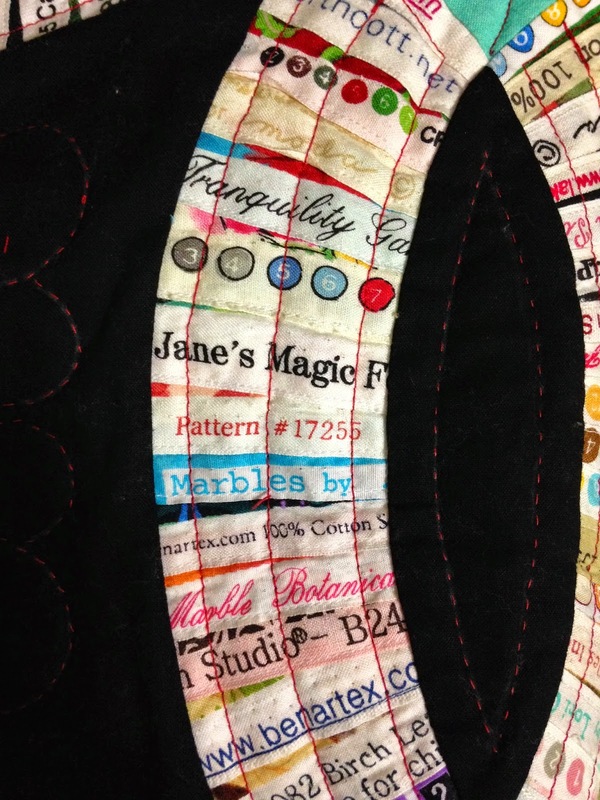 She hand quilted a little feather pattern in the middle of the rings and a simple little outline in the middle of the arcs. She tried to quilt the arcs but the selvages proved too difficult to quilt by hand so she sent it to me. Unfortunately, Ruby trimmed the quilt before she sent it to me. I didn't realize that when I agreed to finish quilting the quilt with Queenie. There was nothing to attach to quilt to the leaders or to clamp to on the sides (thus the reason your back has to be 6-8" longer and wider than the top). It proved to be quite a challenge for me as well. As you can see from the picture below, it's only being held in the from with 5 pins. That's not enough!!!! I did manage to get a little loop de loop in the cornerstone blocks but some of them are kinda wonky. 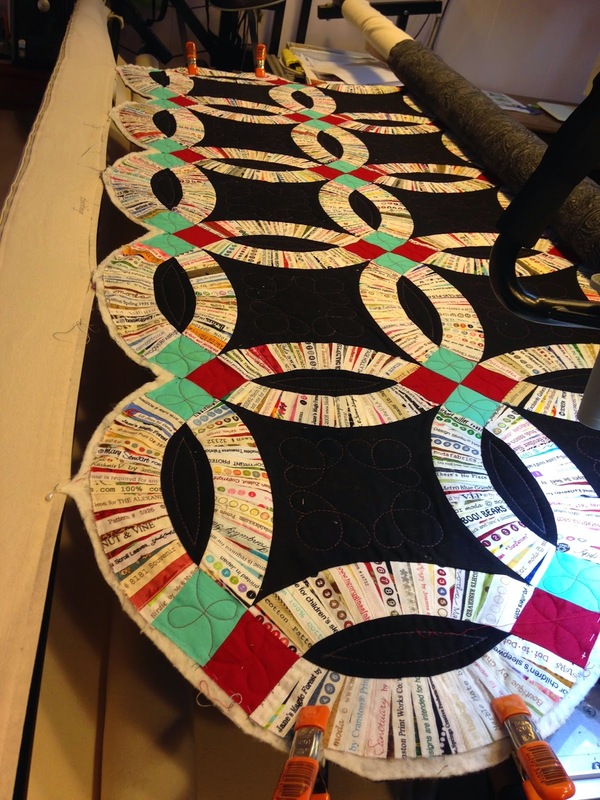 I attempted to quilt the arcs but soon gave up because they were just too crooked and wonky for me. 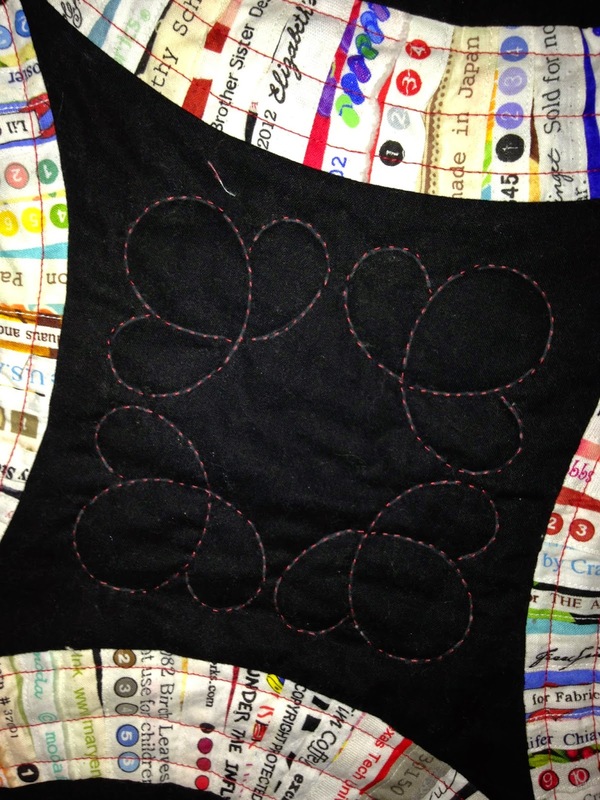 I gave up and took it out of Queenie's frame and quilted the arcs on my domestic sewing machine. I LOVE how the SELVAGE QUILT turned out. 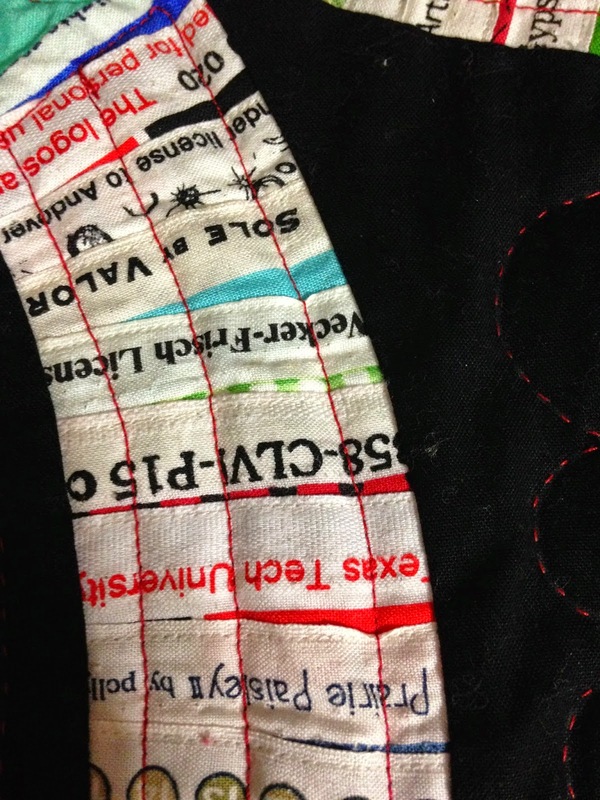 I love looking at all the names and colors on the selvage pieces. It's almost like a memory quilt. Aren't the flip flops in the selvage piece below neat. The fabric companies are getting pretty creative with their little color icons, using things other than circles. The quilt is beautiful. The hand quilting compliments the machine quilting. 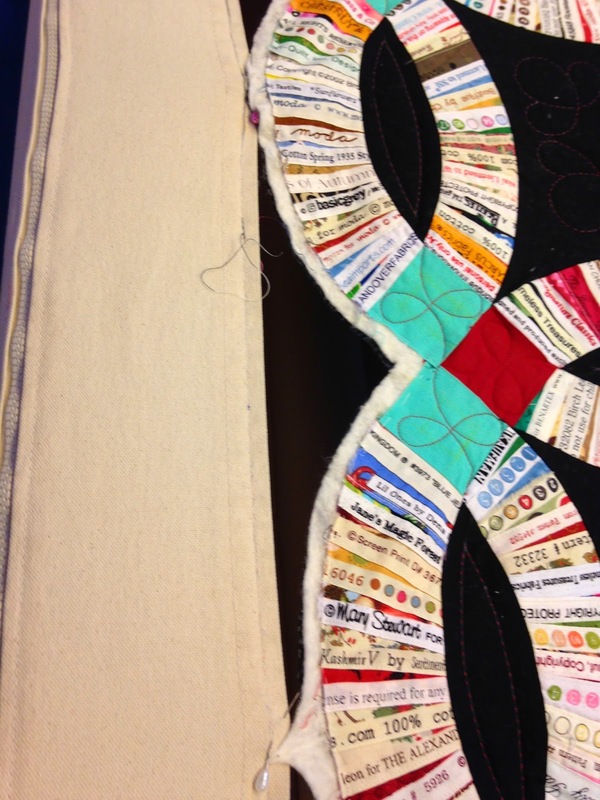 How do you go about piecing the selvages? Are they strip pieced? Wow! That is a LOT of selvages! I cannot imagine (being a relatively new quilter myself) how many pieces of fabric one must have gone through to get those! 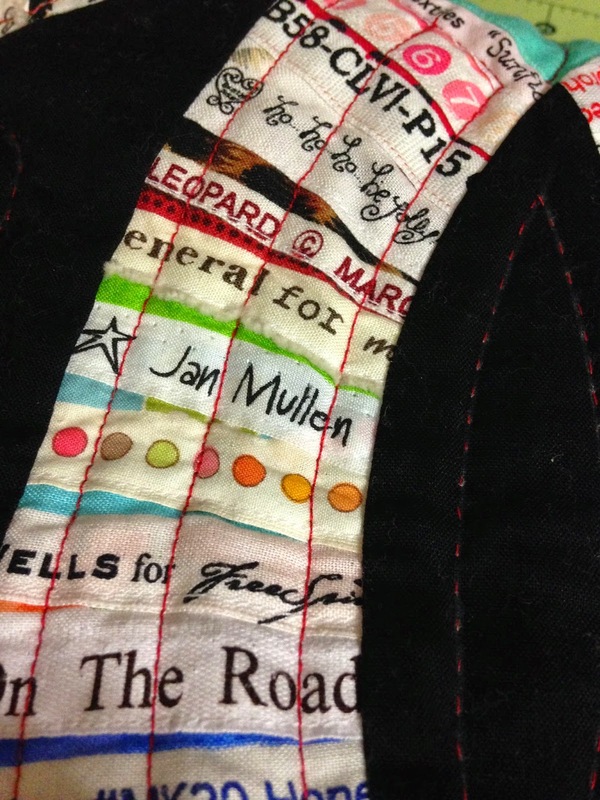 And how cool it looks as part of the quilt! I would have never thought of that!